Major Fredric Arnold (Ret. ), 96, died on Memorial Day 2018, after completing the most ambitious and meaningful work of his life. His monumental bronze sculpture, “Lest We Forget: The Mission”, fulfilled his post-WWII vow to honor the more than 88,000 US Airmen Killed during the war. He flew 50 combat missions and was the sole surviving member of WWII P-38 Class of 42-J Group. He completed the seven year project at the age of 94. 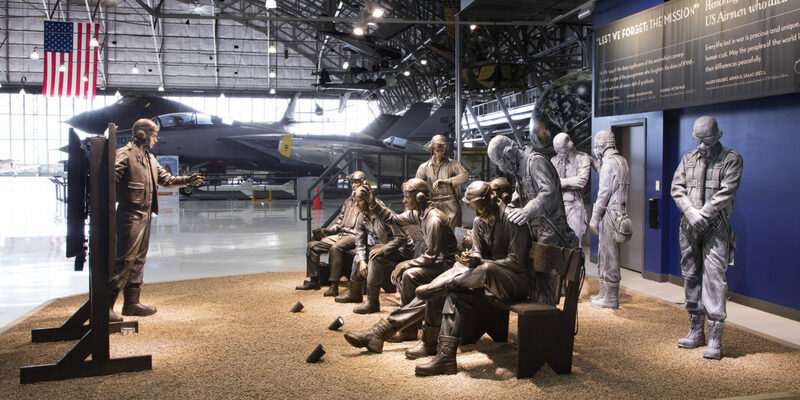 See the completed sculpture at the Wings Over the Rockies Air and Space Museum in Denver, Colorado before it leaves MAY 5, 2019, or see it at the National WWII Museum after its official unveiling and dedication on May 26th, 2019. The following video accompanies the finished monument and describes its history and significance. Please take a few minutes to view this video. The World Premier Public Unveiling was held August 6, 2016 at the Wings Over the Rockies Air and Space Museum in Denver. to join the more than 200,000 people per year who will now see the finished sculpture in person. Arrangements have been made to loan Lest We Forget: The Mission to the National WWII Museum in New Orleans for exhibition on their 6-acre campus. The sculpture depicts twelve fighter pilots during a mission briefing. The lighter colored spirits of aviators already killed in action look over the shoulders of those still alive. All are destined to die. Please view the Gallery pages on this website to see images of the life size figures completed in clay. The figures were cast in bronze and are now on display in Denver. My family and I paid to complete this project. We are hopeful the public will see the value in my work and help us offset the project costs through tax-deductible donations. If you have an interest in helping with this project, please visit our Donate Page. I have just finished reading Doorknob Five Two , the book was given to my Son by a pilot in Australia who knew Fredric as a friend . Both my Son and myself are pilots and we can empathise with the fear and stress of combat flying and have nothing but admiration for Frederic. I am in my late fifties, my Son mid twenties. Thanks to great people like Frederic neither of us have been to war and we can actually enjoy flying and life as free people . I am so glad he survived, lived a long life and wrote his book and did other amazing things . His memoirs have communicated down the generations and touched our hearts , a great man an important talented person. He did what he had to do . Thank you Alan for your kind words. I share your admiration and gratitude for the WWII generation who stood up to the fascist threats of their time. It would be a different world if they had failed. I just gave an interview to AOPA Pilot Magazine. If you have access to that publication, look for an article in their upcoming November issue. Frederick Arnold was a special man. I enjoyed meeting him and reading Doorknob Five Two, and I named a convention in contract bridge Doorknob Five Two in his honor. I regret losing touch with him, and I’m saddened to have learned of his death. My condolences and best wishes to Natalie, whom I also remember fondly. Thank you so much for sharing all of this, to all those who have served as well. My Dad, Lt. Col. Robert B. Fawley, is 94 and is a member of the 367th Fighter Group, 394th Fighter Squadron, the “Dynamite Gang”…P-38 and P-47. He may be the last one, we are not sure. He gave 23 years of service, and could fly any plane he got in. I believe he flew 64 missions in Europe in about a year. My Dad turned 96 Sunday June 10. 35 missions with the 456th Bomb Group, Korean War and Vietnam. To our family he is a hero. Wow? Not much more to be said. What a guy, what a tribute. My father taught fighte pilots in WW1 in San Antoino. And went to come get the SPRING OF 1942 to interst young men to join the Army Air Force. He was in the Air Transport Comand in WW11 coma dead the base at Khartoum Africa during the African campaign and then was in the Solomon Islands during the Pacific Campaign. But I was very luckey he came home. My Uncle flew a B-27. He was a special man. He died a few years ago. Thank you to my Uncle Quentin Ellis and so many more for your selfless acts of courage and bravery. My father was a World War II Navy veteran. He passed away just four years ago at age 93 1/2. I was so proud of him and I’m grateful to all of the military for keeping us safe in the land of the free. Dear Lasko, thank you for writing. Your comment came at a significant time in our lives. We were fortunate to have our father with us a bit longer and cherished every day. I’m so very sad to say he died yesterday and we buried him today. The magnitude of my pain is only matched by the gratitude I have for all he did for me, my family and the country. Thanks Fred for sharing. Those of us who lived during that time all have memories and like others, family members who took part in it. We will never forget. Your comment came one day before Dad’s death and was among the last group of comments and letters I read to him. It gave him great comfort to know his work would continue to touch people’s hearts. I will never forget the sacrifices Americans made in WWII and later wars. The sculptures are a great tribute ! Combat veteran in Southeast Asia having flown 201 missions. My brother spent his WW II years stationed on Guam. He was in the Navy Seabees. I attended a flying event at Brown Field, CA on 5/31/85 and Fredric Arnold and Pappy Boyington were there for a book signing. It was an honor to meet them and have a signed copy of Door Knob Five Two and Baa Baa Black Sheep. Thank you for sharing your memory. I was at that exact same event, met both Arnold and Boyington, and have the same two books, signed. Two extraordinary aviators. War is Hell…and noone knows that better than those that have been in one. What an astonishing generation they were. We buried Dad today. The end of an era for our family. I found this to be very emotional – certainly “The Greatest Generation”. Such a beautiful tribute – let us not forget who & what was sacrificed for us. As an 8 year old I mingled with those Yanks in London knowing that a stick of yankee gum might come my way. As an airforce store man I spent 2 years service in the Deserts of North Africa! This was outstanding to watch. I was in the AF never new the numbers of how many brave men we lost during that war. My father was in WWII in the AF he never spoke much about it I was in Nam and I don’t talk about it eather. Like you and your father, my father didn’t speak of the war. He ‘stuffed’ his memories for more than 30 years. Then in 1977, he lost his brother and he suffered from a sort of breakdown that was diagnosed as a form of delayed PTSD. His doctor suggested that he write down some of his war memories that still plagued him so long after the war. He sat down to write a short ‘confession’ of sorts to me and my sisters. But once he started to write, it all came out. A couple years later, he’d completed a lengthy remembrance that was ultimately edited and became “Doorknob Five Two”, an autobiographical novel. It is 2018 as I write this. He is 96 and as recently as this morning, his eyes welled up with recollections of his role in the war. “So many killed…” he repeated over and over, shaking his head. He is still overwhelmed by the human cost of war. I was deeply moved by the video and the story behind the sculpture. I am retired from the U.S. Navy and, though my record shows I served in a combat zone (Viet Nam), I never had to put my life on the line as the Major did. In addition to being a wonderful tribute to those who made the ultimate sacrifice, I was amazed by the fantastic detail of the sculptures. Thank you for your service during and after the war. “Lest We Forget: The Mission” is dedicated to the immeasurable sacrifice of your family’s Robert Simmons. We hope you have the opportunity to see the sculpture in person. It is there for you and your posterity. As a modern era US Army Aviator (helicopter pilot) at first glance I was put off by some things that looked wrong, like wearing helmets in the briefing, but then having seen the video, I began to understand the symbolism of the art and changed my mind completely. I love this work and would love to have a miniature of it. Thank you Major Arnold. Major — Thank you for your comment and for taking the time to watch the video. We watch the reaction of people at the museum and see the same transformation as people’s first impression of the exhibit solely as a static work of art gives way to understanding that Dad used the sculpture to tell his story of combat. If you would like a miniature, there are two options. A 20″ x 22″ miniature of all twelve figures is available. There is also a limited edition of 50 tabletop bronze sculptures of “Teenager”. Each, corresponds to one of Dad’s 50 combat missions. Each comes with a copy of his combat logbook and a certificate describing the specific mission correlated to the edition number. If you want more information, please use the Contact Us page to send a message. Thank you for your service, Major. WEEK OR SO LATER THEY CRASH IN BAD WEATHER WITH A COMBAT DAMAGED B-17. IS ONLY MENT TO INDICATE WHAT LOSSES “EIGHTH” EXPERIENCED FROM BEGINNING. WHILE, AT 94, AS I DO NOT TRAVEL ANYMORE, I APPRECIATE ANY SUCH DEDICATIONS. Thank you for sharing a bit about your experience with the Eighth. Those of us who are too young to have experienced the horror of WWII personally can’t possibly imagine the hair-thin difference between life and death in those terrible days. We owe the modern world’s safety, security and prosperity to you and your generation. Thank you for remembering and passing on your memory of Mssrs. Robert Griffen, Royal Runyon and their crews. I will pass on your thoughts to my Dad, who at 96, doesn’t access the internet that much. WE where proud to be AMERICAN in those days! Today hey want everything right now? What a wonderful remembrance of such a tragic loss, God Bless them and Thank you for your sacrifice. My uncle, Harold Lorenz, was with the 51st Fighter Squadron in Panama during WWII. They also had P-38’s and he was a gunnery sergeant making sure the guns were working and aimed properly. He got a ride one time in a jump seat behind the pilot and found out why the pilots said the P-38 climbed like a homesick angel. This art work is there to show us what these men and women have given for so many and I hope to see this wonderful Art work in person in the near future in Denver. Thank you, those who gave their all and to the artist for giving us a way to remember them and God Bless. I have viewed this very touching Memorial in Denver. I sat in a nearby chair and studied each subject. Very touching and centered around the great planes that kept us free. A great grouping that all young people should see. It was Dad’s fondest wish that the import of the sculpture would reach across the generations… Not every young person ‘gets it’, but in any school group, there are always those who do. When Dad was up to public speaking, he addressed hundreds of school gatherings in the greater Denver area. The many thoughtful thank you notes demonstrate without doubt that his message reached a sizable fraction of those kids. The horror of war is a tough message, but one that Dad felt needed to passed along. I read your comment to Dad today, who doesn’t use a computer anymore (he’s 96 now). He smiled and waved a bit. I do hope you and your wife get a chance to see it in person. Be sure to check the website before you make the trip to verify it is still here in Denver. At some point, it will likely go to New Orleans for exhibition at the National WWII Museum. While none of my family members were pilots, a couple uncles were bombadier’s with the 505th bomb group, neither survived, they were both killed prior to end of war in January and February 1944. The older uncle, Lt. James Allen Burner’s plane caught fire and wound up going into the ocean completely on fire near Japan, with only survivor parachuting out. My second and younger uncle, Lt. Hugh Donald Burner’s bomber collided with another bomber over Japan and both crashed and burned on the ground with no survivors. There is now a memorial in that Japanese town for these two bombers and the ashes of all crew members were turned over to the U.S. Military after war was ended. I know that many bomber crews made it safely home due to the resiliance and perseverance of the fighter pilots who were their guardians while they were on their bombing missions. May all the families of all 88,000 American Airmen be blessed as they realize the service as well as the lives of their family members that were given for their country. God bless America and God bless all military who are currently still alive in all branches of service. Thank you for your heart felt good wishes. The project is dedicated to men like your two uncles. Dad dedicated seven years to convey the very message you’ve written. I hope you have the opportunity to see and appreciate the sculpture in person as a memorial and remembrance of your uncles. You come from an extraordinarily dedicated and lucky family line. My deepest thanks to you and your family for serving. While the general public can never fully appreciate the debt we owe, we are gratified to see people of all ages taking the time to sit and contemplate the message of Dad’s unique memorial. In this day and age of sound bites lasting seconds, it is quite amazing to see people of all ages sit for 20-30 minutes simply contemplating the sacrifices embodied in Dad’s artwork. Not a few tears are shed. As an EX A-1 USAF Skyraider pilot who flew 250 missions in S Vietnam in 1964-65 I was very impressed by your video, I hope someday to see the actual sculpture in the Denver museum. My best to you in your endeavor. I can’t even remotely imagine, let alone appreciate, the magnitude of 250 combat missions. Each war has it own technology and tactics, but it still comes down to the MEN. 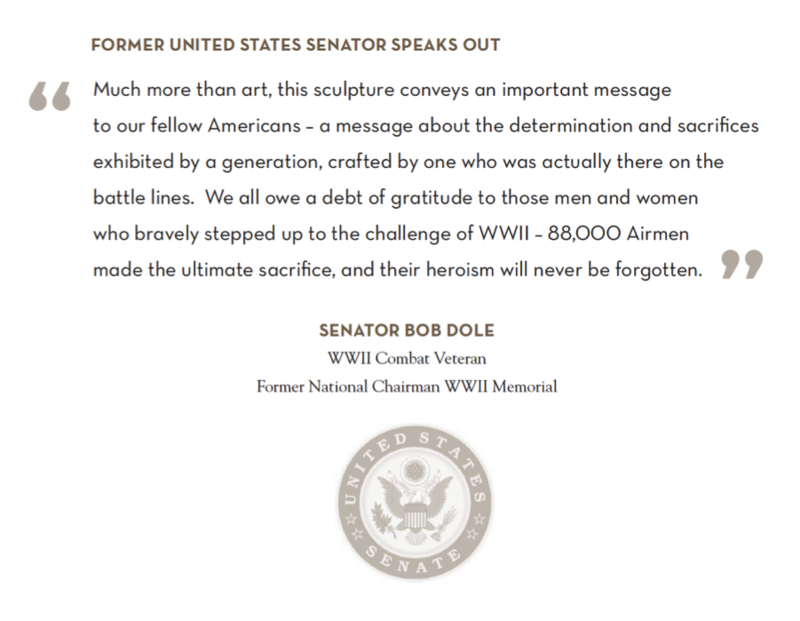 The Denver Air and Space Museum tells us all the time they are grateful to have the sculpture there because, more than any other exhibit, it is about the MEN. My father, Robert Capen, is also the last surviving P38 pilot from his squadron. Devilishly handsome still, an artist and sculptor, he walks 3 miles daily and would welcome cameraderie of surviving P-38 pilot/veterans. Thank you for your kind comment. Dad’s book, “Doorknob Five Two”, has been optioned by different movie production companies over the years, which is proof that it has appeal to Hollywood. One of these times, all the factors (financing, lead actors, aircraft special effects, etc.) will all come together and a film will get made. I had the great opportunity to see this exhibit in November, 2016 at the museum. It touched me deeply. I am retired Army, and a history buff, but I may have overlooked the sacrifice of the US Army Air Corps in WWII. These sculptures, and the accompanying stories of the men they portray brought that harsh reality to the forefront. It brought tears to my eyes to think of so many young men lost in war, many whose identities and memories are already forgotten. We should never forget the sacrifice and service of our nation’s heroes. What an outstanding exhibit. I highly recommend you see it, and, if you can’t, watch the video! Thank you for your service, Mr. Fuhrman. We can never fully know or appreciate the debt we owe to the countless soldiers of every branch of service that paid for our freedoms. It is heartening to see Dad’s sculpture affect people of all ages and backgrounds. West. All the best to youband your family. Sam Duncan, USAF 1961-68, Vero Beach, FL. Thank you. Lt. Bob Fisher from Burnettsville IN, was the first cousin of my father. He spoke of him a view times, always with a great deal of pride mixed with sadness. I hope to be able to see this beautiful memorial someday soon. Finding relatives of Dad’s original group of 14, including your father’s cousin, Lt. Bob Fisher, has been a rich reward for doing his monument. Bob Fisher’s son and two grand-daughters attended the dedication of another memorial project done by my father… a 20×16 foot mural. Their attendance was included in the documentary, “Between Two Worlds”, by Aaron Weisblatt. I was also there and it was a deeply touching tribute. The grandson of Jim Hagenback, the other survivor, is coming to Denver in October to visit with us and to see the sculpture. You are welcome anytime. Made a special trip to see sculpture on day off and worth the time to see it and contemplate the meaning of each of the figures and the positions of the figures. I have visited the WWII museum in New Orleans and it will be a wonderful addition. I have found the stories behind the people who have served in our military to be very humbling to me in what they had witnessed and experienced in their lives. I served in the Air Force in the late 80’s and early 90’s and have my own “military stories”, but I did not experience combat or the life threatening experiences of many of our past and current soldiers and airman. I have the utmost respect for them and thank them. Thank you Maj. Arnold for your service and this tribute to your fellow pilots. This brought tears to my eyes. Thank you seems to little for the great gift you have given every citizen . I have been blessed by the freedom that all those who serve have fought so hard to protect. All of you are in my prayers every day. Arnold visited monuments and museums but could not come up with an idea. Eventually, his daughter-in-law suggested that Arnold use the 10 maps he had been given by his crew chief as background for painted memorials. Arnold liked the idea and, using the maps, created 10 panels on which he painted murals. 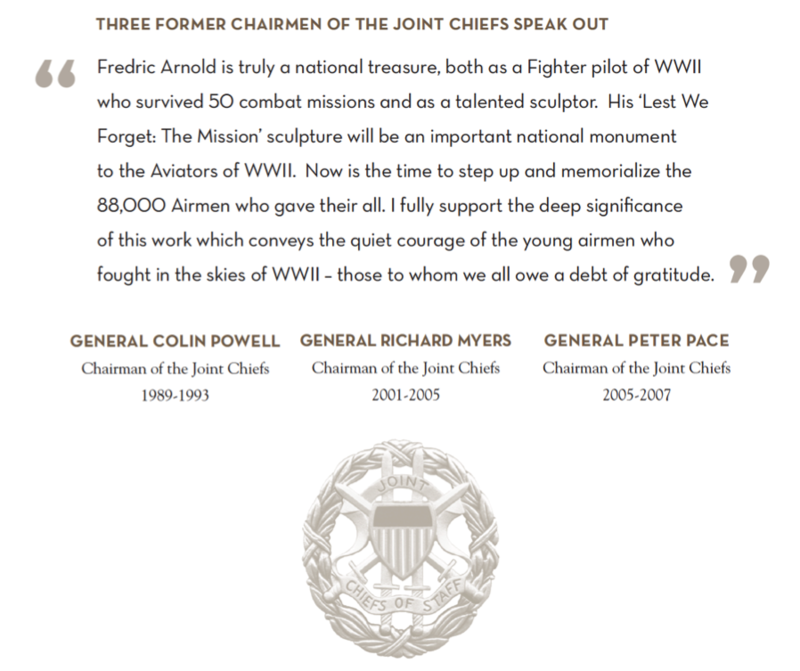 While Arnold’s memories of the 12 fellow pilots in his class provided the inspiration, the sculptures intend to represent the 88,000 airmen who were killed in combat in World War II. The piece differentiates between living pilots and those who had been killed in action by the color of the metals, with the dead men in a more pallid hue. We unknowingly came across your sculpture at the museum yesterday. We brought our 14 year old WWII history buff nephew with us. He was quite enamored with your beautiful, thought provoking work. Our group all felt your work was a wonderful tribute to those who sacrificed everything for this country. As the daughter of a man who served two tours of duty during WWII, and survived, I am so touched by this beautiful tribute to those airmen who did not make it home. If my father, Walter Adren Whitcomb, had not survived the war, I would not exist. It is ironic that he survived his service in Germany, Japan and the Philippines, and then lost his life in a tractor accident, while preparing for a new home for our family. I was a little more than 3 years old, and my brothers were approximately 6 and 8 years old at the time of our father’s death. My mother, Bessie Lockhart Whitcomb, who was only 28 years old when my father died, worked very hard to provide for us and raised my brothers and myself in a way that would show respect to all who served our country, regardless of when or how they served. Both of my brothers served during the Viet Nam war, and my uncle, Ray Lockhart, who passed away several years ago, began his service during WWII and was a career Air Force pilot. This beautiful sculpture is an amazing tribute to those who served in The Great War, as well as to all who have served our country in any capacity. I am so moved by the dedication it took to complete this project and it is my hope to see it in person some day. Thank you so much for your devotion, Major Arnold and Marc Arnold. You have created a lasting treasure for our nation. Peggy — Thank you for sharing your connection to the work. Dad was especially honored by the presence of the nephew of one of the original 12 pilots in Dad’s Group killed in the war. Like you, he had a strong bond to his uncle and other members of his family who served in the war. They hugged and cried over their shared loss after so many decades; Dad because he knew his uncle, the nephew because he never knew his uncle. Loss, mourning, respect and gratitude can all leap across generations, time and distance. On July 26th, while visiting old friends in Ft. Collins, CO, I received an email from an old buddy that I flew with in Vietnam, with a link to the “Lest We Forget: The Vow” video that is on the home page of this site. I watched it early in the morning. Later that day, my friend and I were going to drive down to Denver to visit the Wings Over The Rockies museum. During the drive, I told my friend about the video. He is a pilot and his father was a Navy pilot in WWII. Well, we toured the museum for a couple of hours and were on our way out when I was surprised to see the sculpture being set up, and then realized I was looking at Marc and Maj. Arnold as they worked on the project! I was astounded. I had just seen the video that morning and now I am talking to Maj. Arnold! It was a special moment for me and I want to thank you for taking the time to chat with us and allowing us to take photographs. My wife and I are donating to the project and look forward to seeing it in New Orleans. Thank you for your dedication, and your art, to help insure that those who paid the ultimate price will not be forgotten. Thank you, David. It was a pleasure to meet you. You were present at a special time as the finished monument was coming together. Now that the finished monument is on display, the video on the home page of this website has been changed to reflect the 13 minute video that is part of the exhibit. All good wishes. Be well. He went on to write and illustrate the first flight manual for the P-80. So it is possible you studied from his manual (or later revisions). It is kind of you to invite Dad to contact you by phone. He has many of his faculties, but phone calls have become difficult recently, so that is not likely to happen. He did, however, ask me to pass along his best wishes to you… I’ll add my own! We worked on the installation for a week before the first public unveiling yesterday. You were among the lucky few that got a sneak peek. Now that it is fully exposed, I hope you have the opportunity to revisit the museum. As an occupied country during WWII, the Netherlands suffered dearly at the hands of the Nazis. The loss of life there was truly horrific. I have had the pleasure of working with the Arnold family in designing and setting the lighting for the Lest We Forget memorial. I quickly recognized the importance and magnitude of this great work of art. Maj. Arnold not only created a masterpiece, but has brought new awareness to an often forgotten war and the people who lost their lives defending our Country. I hope that our younger generations will gain insight and appreciation of the enormous sacrifices made by a generation of Americans, now almost all gone. This sculpture is a great way to stir the interest and encourage all of us to go back and absorb this time in our history and really understand what WWII was all about. Congratulations Maj Arnold for creating a permanent dedication and remembrance for now and every generation to come. Thanks for your help with the project. Bronze is a difficult medium to light and your expertise made a big difference. We have a photo shoot scheduled in the morning to capture images of the finished bronze figures. When time permits, we will post these updated images so people visiting the site can appreciate the lighting work you did. Truly awesome story. I just finished a book on my dad’s service in WWII and was touched by the lives that he touched (and was touched by) as a pilot. I so envy Maj. Arnold’s son for taking the time to help his dad create this lasting legacy. As a retired Air Force fighter pilot myself who lost far too many comrades both in battle and in peacetime, this memorial is a fitting tribute to those who lost their lives in defense of our Republic. There is a special place in Heaven for such noble souls. Like you, I have been fortunate indeed to be able to support my father in a project that allowed me to appreciate the sacrifices of his comrades. My thanks to you and your father for your service. Our son and 5 of our young grandkids had the honor of meeting Maj Arnold July 27, 2016, the day y’all were setting up the sculpture exhibit at Wings. We talked for 12 – 15 minutes and captured a few photos of the war hero which we will treasure. I felt so humble conversing with this great unassuming man of my parent’s generation, the Greatest Generation. Thank you Major Arnold and your son, for bringing this profound, humbling, magnificent sculpture to Wings Over the Rockies . . . to our American countrymen. We will one day get to the World War II Museum in New Orleans to view this wonderful tribute to your buddies of 42-J and the 88,000 heroes otherwise lost to the ages. I’m a retired Air Force pilot, too. I can’t imagine a finer tribute to your comrades — everyone who ever fought for our Country — than this. It’s not a marble obelisk or plaque; it’s people. God bless you.